1 color picture, 1 B & W line drawing and instructions on how to paint. 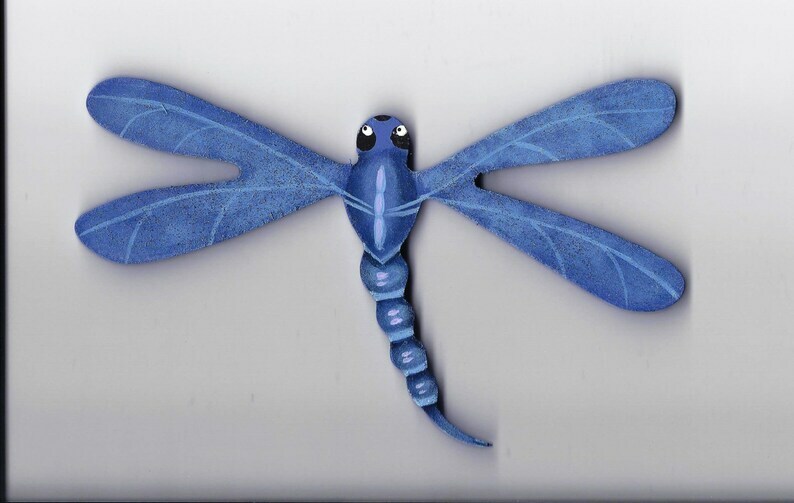 The dragonfly was bought at the dollar store or you can cut one yourself. They are also readily available at most stores and on-line laser wood cutting shops. The dragonfly measures approximately 3.5" X 6"W.
PLEASE NOTE: This item is a downloadable PDF copy for THE PATTERN ONLY. Once payment is received, I will send you the PDF file to your email. This item is copyright protected: LeeArt 2015, and artists retains all copyright. You may use this pattern to paint items for yourself or for sale for pin money. Lovely and whimsical, promptly shipped, well packaged. I will definitely order again. The snowgirl porch greeter is adorable. It arrived with some slight damage with the but it was easily corrected; the seller was very responsive. The artwork is beautifully done and the colors are quite vibrant. I am very happy with this item. Love it. Just as described and arrived on time and well packaged. LOVE LOVE LOVE! We order a personalized ornament every year for our 6 year old son....he's crazy for his chickens and i cannot tell you how much he loved this ornament. I accept all payment methods available on Etsy.ca. I guarantee all my items and if you are not happy with your new art, please convo me to arrange a refund. The return shipping fee is the buyer's responsibility. There is no return for commissioned or personalized art work. Cancellations must be made within 24 hours of purchase as our art is shipped within one to two days. Object. You can object to (1) my processing of some of your information based on my legitimate interests and (2) receiving marketing messages from me after providing your express consent to receive them. In such cases, I will delete your personal information unless I have compelling and legitimate grounds to continue using that information or if it is needed for legal reasons. For purposes of EU data protection law, I, (Cathy Brown), am the data controller of your personal information as it relates to inquiries made or purchases you make through my Etsy Shop (Lee Art). If you have any questions or concerns, you may contact me at (LeeArt@live.ca).